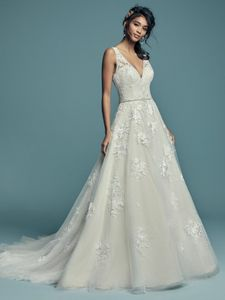 Description: This vintage-inspired ballgown features lace appliqués over whimsical layers of textured tulle and Chic organza. Featuring a V-neckline, illusion straps accented with lace appliqués, and square back. Swarovski crystals and beading add shimmer and ethereal texture. Finished with covered buttons over zipper closure. Detachable beaded belt featuring Swarovski crystals sold separately.